In 1906, Congress passed the Game and Bird Preserves Protection Act (Refuge Trespass Act) to regulate and protect fish and wildlife refuges. From 1906 to 1948, Congress amended the Act to expand the scope and consolidate penalty provisions from other Acts in order to highlight their intent to protect all national wildlife refuges, fish hatcheries and breeding grounds. Violators caught hunting, trapping, or disturbing wildlife could have been fined $500, imprisoned for a maximum of six months, or both. The Refuge Act came on the heels of the environmentalist movement, which sprung up in the late 19th century and early 20th century. 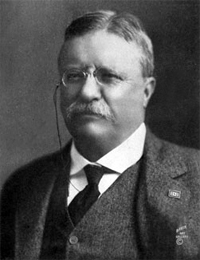 In fact, the Act was passed under President Theodore Roosevelt, an avid outdoorsman and proud environmentalist. The Act’s passage became a monument to his enduring commitment to wilderness conservation. President Theodore Roosevelt, 26th President of the U.S. and proud environmentalist. In order to properly enforce the Act’s provisions, the populace had to be educated and informed about the law. Therefore, signs were needed around wildlife refuges to notify individuals that nearby lands were federally protected. 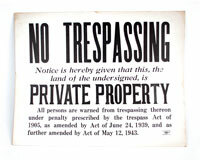 These signs were of the warning variety: typically, a “No Trespassing” sign as seen below. This dated “No Trespassing” sign notified persons to a nearby federally protected wildlife refuge. The sign also explains the reasoning for the prohibition by explaining the legislation, namely, The Refuge Trespass Act. These “No Trespassing” signs were common sights on the peripheries of wildlife refuge intended to educate the innocent and unknowing passerby to deterring the knowing would-be-criminal. Thus, these signs served a double purpose: educate and deter. These signs, however, had a slight technical drawback: they were made of cardboard material. As opposed to today’s waterproof, high-grade 3M aluminum signs that ensure long-lasting durability, older signs from the early 40’s were frequently made from fragile, weather sensitive cardboard. Consequently, the signs did not last long and were worn down by the elements. During WWII, concern about espionage and sabotage became more acute. 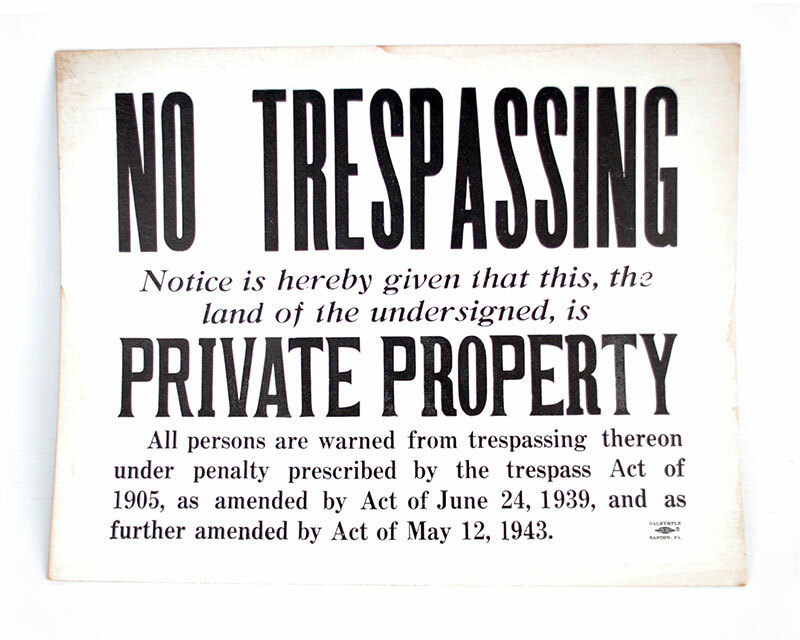 As a result, more durable No Trespassing signs started to appear. Today’s signs, meanwhile, display bold colors like red and orange to grab the eye’s attention. 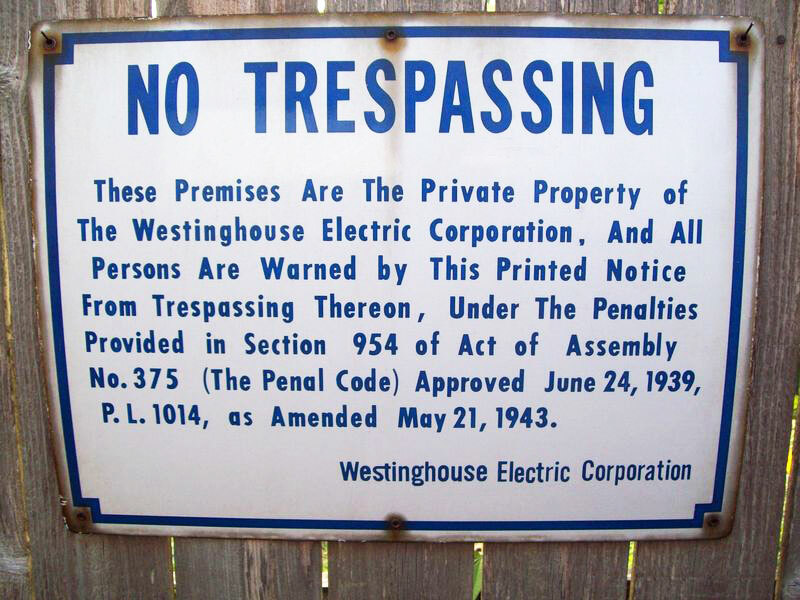 The sign below is a good example of a modern day, hard-to-miss “No Trespassing” sign that is a direct descendent of the older sign seen earlier. Older signs also lacked graphics; they relied heavily on text--consequently assuming that every viewer reads English. Modern signs, on the other hand, offer graphics and text, are bilingual, and can be customized. This makes it unlikely for any viewer to misunderstand the message. Although the Refuge Trespass Act was superseded by the Fish and Wildlife Conservation Act of 1980, the Refuge Act has yet to be repealed. The Act of 1980 still retains much of the original act remains, albeit the punishments might have changed: a bigger fine and a longer jail sentence. On the same note, “No Trespassing” signs may have evolved but the message has remained the same: keep out! 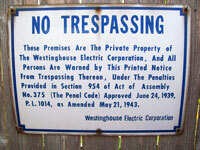 Take a look at our entire line of no trespassing signs.